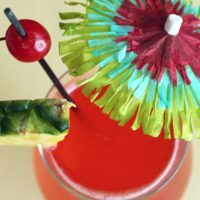 The Zombie cocktail was invented by Donn Beach, of Hollywood’s Don the Beachcomber restaurants, in the late 1930s. This vintage drink is called Zombie because that’s what it can turn its drinker into. It’s a high-octane cocktail full of delicious fruit juices that make you feel like you’re downing sophisticated candy. But that deliciousness hides quite a lot of liquor. There are several variations on this cocktail because it’s been around a long time and bartenders have tinkered with it. This version is more or less the original. But the gist of this drink, in all its variations, is rum, rum and more rum with pineapple and papaya juice. It’s the papaya juice that makes this one fairly unique. In fact, I believe the Hairy Jerry is the only other cocktail I’ve featured that has papaya juice in it. And if you love the Zombie, you should check it out. Just rum and payapa juice. If you’ve ever tasted papaya and thought it was horrible, you probably just got an underripe fruit. When it’s nicely ripe, it has a sweet, mellow taste that’s sometimes described as a cross between banana and pineapple. Any bottled papaya juice you get will have that flavor, and it’s very nice. Especially blended with the pineapple juice and all that delicious rum. You’re encouraged to experiment with your Zombie and find precisely what you like. The beauty of this recipe is that you can’t really screw it up. Do you have some variations of your own for this one? If so, leave them in the comments! This is the more or less original recipe for the classic Zombie cocktail. So named because you may end up stumbling out of the bar. Shake all the ingredients except for the 151-proof rum together in a shaker. Pour the mixture into a glass (this one just calls out for a funky-shaped glass). Pour the 151-proof rum on the top of the drink. You can definitely light your Zombie on fire at this point if you want. Garnish with a cherry, a slice of pineapple, an orange slice, all of the above, or pretty much whatever fruit you feel like. So, I have never had a zombie. Are the ingredients telling me that I will NEVER get to try the classic????? Being as some idiots made it so Bacardi 151 was dicontinued?? Nah, there are other 151 rums out there, like Cruzan. But you don’t really need it for the flavor – I would just add a half-ounce more white rum in place of it.